Building trust and developing a strong ‘implementation’ mindset with clients is our number one priority. Our speciality is organizational analysis, and designing and tailoring solutions to meet specific client needs. With a strong background in organisational and behaviourial analysis we focus on implementing change rather than mere theorizing. Our core competence is to work with our clients to make the introduction of needed change easy, flexible and natural. We work with people so they become the Change and the purveyors of change. We enable them to master key change agent skills and practice these to make the change process easy, simple and quick rather than complex, slow and ponderous. We design the learning reprocess so that learners will acquire skills quickly and can put them to work. 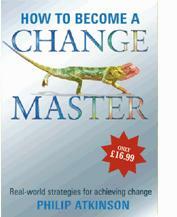 We turn 'resistance' into 'acceptance’ of change using our unique methodologies and behaviourial tools. Our core competencies include OD, culture change, behaviourial change, Leadership Lean OD, business coaching, team psychometrics and the provision of training in influence and persuasion to develop effective change agent skills. We specialise in partnering with internal change consultants for large financial institutions and public sector organizations on interim consulting projects. We have extensive consulting experience in Banking & Finance, Genetics, Manufacturing, Plastics, Retail, Energy & Oil, Professional service and Legal Firms, Brewing & Distilling and the Service Sector. Philip Atkinson is Managing Director of Learning Strategies Ltd (LSL) an Organisational Development advisory firm focused on creating and implementing strategic and operational change. A leading practitioner, thinker and writer on change, he has developed unique learning and development material into ‘Learning Strategies’ for a wide range of organisations. Philip has generated over 300+ articles published in Management Journals, as well as authoring White Papers, designing bespoke training modules, with seven hard back books, eBooks and on-line learning packages. Increasingly, we are offering Facilitator and Train the Trainer events for organizations which want to use a variety of our tools and simulations and tailor these for specific purposes. This site is home to some of the most innovative and thought provoking interventions, learning and change processes, events and business tools available from visionaries in this field.